Mostly sunny skies. Warmer. High 76F. Winds S at 10 to 15 mph.. Partly cloudy skies in the evening, then becoming cloudy overnight. Low around 55F. Winds SSE at 5 to 10 mph. 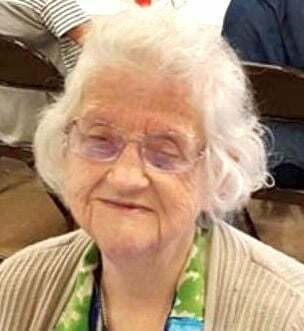 MURPHYSBORO — Opal P. Johnson, 91, passed away at 4:20 p.m. Tuesday, April 9, 2019, in Manor Court of Carbondale. Opal was born Nov. 26, 1927, in Sand Ridge, to Lafayette and Muriel (Clark) Gill. She had worked as a seamstress at the Calcrest Factory in Murphysboro. Mrs. Johnson was a very active member of the Church of the Nazarene, until her health failed. She married Joseph Johnson on May 9, 1946, in Hernando, Mississippi, and he preceded her in death on April 17, 1992. Opal is survived by five children, Joe (Marla) Johnson of Chester, Ron F. (Donna) Johnson of Murphysboro, Dan (Debbie) Johnson of Percy, Phyllis (Pat) Maloney of Peoria, and Rita (Gary) Followell of Saginaw, Texas; one daughter-in-law Rosalind Johnson of Carterville; 15 grandchildren, Steve, David, Shawn, and Jeremy Johnson, Danielle Blythe, Jennifer Johnson, Joshua and Joey Johnson, Megan Hull, Ashley Dunn, Eric and Brian Maloney, Jacob Followell, Derrick and Brandon Johnson; 21 great-grandchildren; and three great-great- grandchildren; one sister, Ethel Davis of Tulsa, Oklahoma; and one sister-in-law, Barbara Gill of Tulsa, Oklahoma. She was preceded in death by one son, Chester Johnson; two grandsons, Christopher and Joseph Johnson; five brothers, Leonard Clark, Glen Gill, Harold Gill, William Gill, and Leon "Bud" Gill; five sisters, Mildred Asbury, Jenny Carter, Mary Johnson, Rosie Camden, and Eileen Moake. Services will be at 2 p.m. Saturday, April 13, in Pettett Funeral Home, with the Rev. Jim Frye officiating and burial in Worthen Cemetery. Visitation will be from noon to 2 p.m. Saturday at the funeral home. Memorials may be made to the Church of the Nazarene or to Worthen Cemetery. For more information, visit http:/www.pettettfuneralhome.com.